It's going to be a very busy 50th anniversary year for our friends at Commando Comics. Some dates for your diaries, gentlemen. 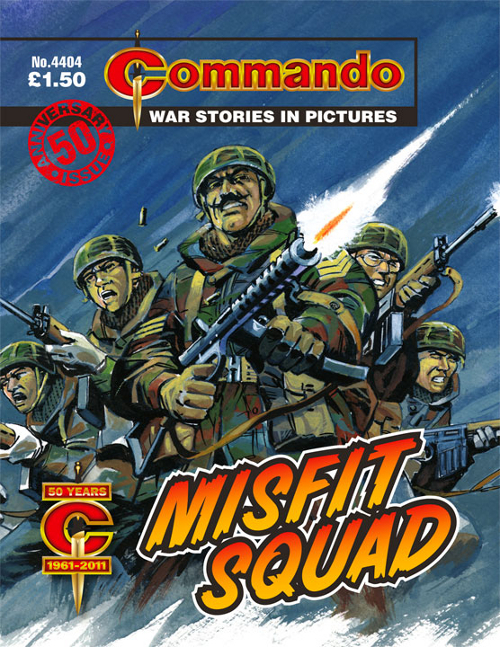 A new 50th birthday edition, Misfit Squad, is now on release. And a good read it is too. I whipped a copy out of W. H. Smith as soon as I saw it. Opening in September, the National Army Museum presents Draw Your Weapons: The Art of Commando Comics - an exhibition that explores the history of the comic with cover art from over 70 Commandos. A new Commando serial begins on The Tweed Pig. After much anticipation, Commando Comics in association with The Tweed Pig, will begin serialisation of The Sand Devils this week. Tune in for the first exciting instalment and receive a discount code for a very generous subscription offer.